The team from Ngā Taonga Sound and Vision’s Christchurch office occupied Gap Filler’s Dance-o-Mat on Sunday as part of the BECA Heritage Week Family Fun Day. 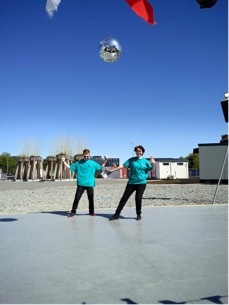 The Dance-o-Mat is a post-quake Christchurch institution – a portable dancefloor, complete with mirror ball, speakers and lights, powered by a coin-operated washing machine. It is currently located in a gravel patch in a still somewhat post-apocalyptic corner of the CBD. It was a scorcher of a day, with a nor’wester blowing, bright blue skies and the temperature getting up to 27°c. 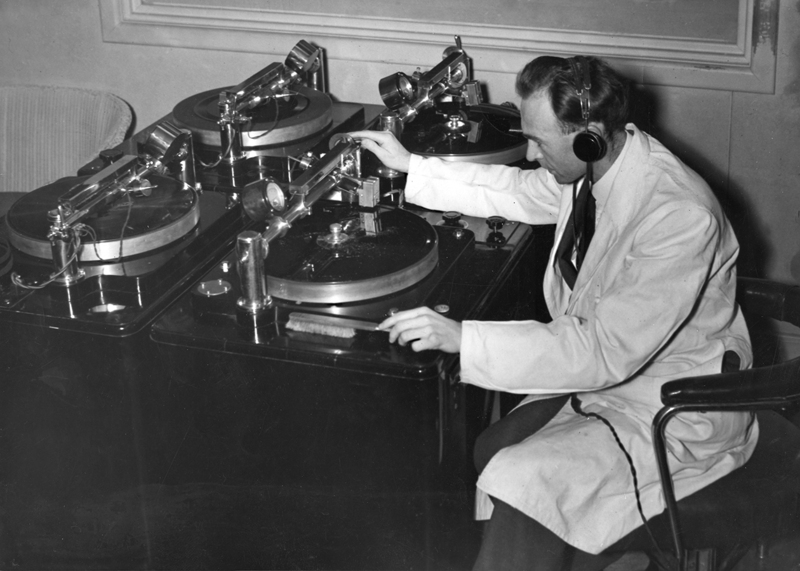 Appropriate then, that one of the songs we were playing was the jazz standard “Blue Skies” – from our collection of historic radio recordings of Christchurch’s first jazz concert at the Radiant Theatre in 1951. The songs featured early New Zealand jazz greats such as band leader Martin Winiata, vocalist Coral Cummins, and trumpeter Doug Kelly. 93-year-old Doug is still going strong and came down to listen and introduce himself. Our team, and some of our visitors, were thrilled to meet him and listen to some of his stories of the Christchurch jazz circuit of years gone by. More can be heard on a recent episode of Radio New Zealand’s Spectrum. Ngā Taonga Sound & Vision audio conservator Sandy Ditchburn and local jazz legend Doug Kelly. Local swing dancers, The Swingtown Rebels, performed two sets of routines and social dancing, which drew a crowd of onlookers. 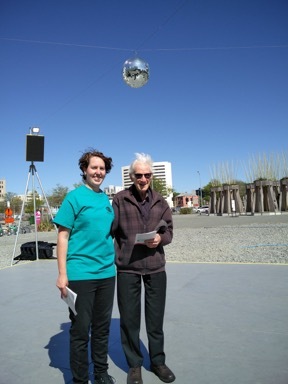 The blank wall in the background is the side of the newly-rebuilt Isaac Theatre Royal, which hosted a screening of archival film featuring Christchurch from Ngā Taonga Sound & Vision’s collections, also as part of Heritage Week. 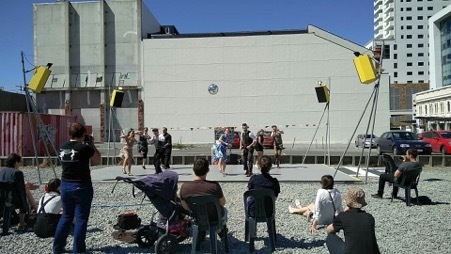 As well as jazz, a recording of the Christchurch Cathedral bells rang out from the Dance-o-Mat speakers, in view of the partially demolished cathedral. The sound brought a tear to the eye of some guests, who had not heard them since they were silenced by the earthquake nearly five years ago. A Portacom classroom played host to our compilation of kids’ radio favourites from the 1960s and 70s, and was a welcome place for families to sit and have a break out of the sun. Although the strong, dust-filled nor’wester did its best to blow us away, a fun day was had by all who attended. Ngā Taonga Sound & Vision staff Shaun and Sandy test out the Dance-o-Mat. Listen to more of the Sounds of Lost Christchurch played at the event here. A big thank you to Gap Filler and SCAPE8 for use of their facilities for our event, and to Chris Bourke, Tamara Smith, Tom Rainey and Aleisha Ward for sharing all their knowledge about Christchurch’s jazz history.